You’ve got to feel bad for the Sweary Scottish Squaddies that form the veteran Special Forces team known as S-Squad. Honestly, they really can’t catch even the most basic of breaks when it comes to the assignments they’re given by their superiors, and the creatures that they’re forced to fight as a result. In facts, let’s just do a quick recap of what they’ve had to face in their previous adventures in the S-Squad series by William Meikle. They started off by having to face a horde of gigantic, flesh-eating isopods off of the coast of Canada when searching for a rogue Russian spy trawler. Then they were dispatched to the Arctic and ended up fighting an alien UFO and a platoon of frozen Nazi zombies that refused to stay dead for a second time. That’s a hell of a lot to face in the course of just a few days, so you’d expect them to perhaps get a few easier missions as a result. But instead they end up travelling to a remote area of Siberia and being pursued by genetically modified creatures created from ancient animal DNA; and then, most recently, trying to rescue a corrupt businessman from a snake-cult in the depths of the Amazon. They don’t have the easiest of jobs, is what I’m saying, and author William Meikle seems to have taken a certain sadistic glee in hurling every conceivable cryptozoological creation he could think of at them and then seeing if they can cope. Against all odds they did actually manage to survive, and it’s been a hugely enjoyable journey watching them do so. So I was of course excited to hear Mr. Meikle announce that a fifth S-Squad book was due to be published by Severed Press, and that this time it would take place in Scotland. That was certainly a relief – what could possibly go wrong for the squad there? Now, where are they staying? Let me just consult the back cover blurb here – it says something about, erm…Loch…Ness? Yes it’s the fifth S-Squad book, Operation: Loch Ness, and far from the well-deserved rest and relaxation that they deserve, our gallant and battered heroes will soon be neck-deep in a fight to the death with whatever mysterious creature is feeding on the animals residing in a local wildlife preserve. What that creature might be is hinted at with yet another delightful cover image from Severed Press, a member of S-Squad staring down the open gullet of some gigantic prehistoric beastie. Severed Press always do wonderful cover images, and this is no exception, even if unfortunately I still don’t know who to credit individually for the work. 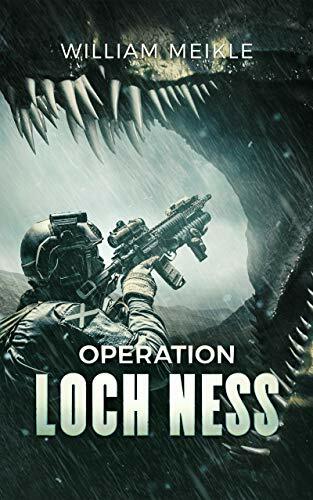 Operation: Loch Ness opens, appropriately enough, with a torrent of blood and guts, as we discover that something – or somethings – have torn a bloody swathe through a wildlife preserve in Inverness-shire. Whatever did it was powerful enough to dismember a Polar Bear and a Lynx, along with a host of other unfortunate wildlife; and being the nearest the British Army has to being “experts in this weird shite” as their commanding officer puts it, S-Squad are dispatched to investigate. It may be as close to home as they’ve been in a long time, but they’re at a distinct disadvantage, which I rather appreciated as a change-up in the series formula; they can’t exactly be toting their usual heavy weaponry around the Highlands, so to begin with they’re stuck with pistols against whatever is terrorizing the region. And even when they do get better weapons, they still can’t go into a blazing gunfight as if it were the Amazon. By now the characters that make up S-Squad are like old friends to me, as I’ve been following their adventures since the very beginning; and just as importantly, indeed perhaps even more so for the reader of Operation: Loch Ness, is that they feel like old friends to each other as well. In a genre which has plot devices and tropes that usually spurn particularly well-developed characters in favour of cardboard cut-outs that will be killed before the end of the book, the S-Squad books are a refreshing change. It seems like with every book the four men in the squad become more fleshed-out and consequently more human, with Meikle skillfully building up and then maintaining that comradeship between them. Certainly for me, it’s one of the biggest draws of the series, finding out a bit more about each man – this time, for example, that chatterbox Private Wiggins is so voluable because he was born into a large family where you got noticed if you made sufficient noise. Or McCally’s family history in the Highlands and the legends associated with them. As the squad get deeper into the Highlands, it becomes obvious that they’re yet again tracking a cryptid creature – something that should technically only exist in legend or mythology. Setting this tale in Scotland allows Mr. Meikle to unleash the full power of his innate knowledge of Scottish mythos and lore, drawing on it to bring into being these cryptids and also referencing other legendary creatures such as the infamous Kelpies. It’s obviously a subject that he has a huge wealth of knowledge to tap into, and it really shows in the depth and detail of the folklore that’s invoked, which in turn enriches the narrative as a whole and makes it feel much more engaging. This is allied with Mr Meikle’s great skill in invoking a sense of atmosphere and tension as S-Squad begin to hunt down the cause of the local wildlife being slaughtered, with some excellent descriptive prose bringing the wilderness and isolation of the Highlands to life, and really driving home just how easily a supposedly-mythical creature could actually live undisturbed for centuries at a time. Meikle always introduces a twist in the narrative or in the format of the S-Squad books, and here it’s the presence of The Colonel, the squad’s isolated and mysterious superior who wields a huge amount of military and political clout. Things go sufficiently bad that he’s forced out of his office to the Highlands, where the squad is then given carte-blance to deal with whatever is happening. He remains in the background, but again it’s a sign of Meikle not taking the series for granted and keeping the formula fresh and engaging for the reader. We also get another entry in Mr. Meikle’s shared universe, his equivalent to the Marvel Cinematic Universe (the Meikle Cinematic Universe?) as the S-Squad series officially crosses over and meets up with a member of the Seton family, Scottish practitioners of arcane and occult magic who often appear in Mr. Meikle’s works. Add in movie references to everything from Jaws to Dog Soldiers and you have a recipe for a highly entertaining and action-packed ‘creature-feature’ novella. Speaking of action, Meikle does an exceptional job in progressively raising the tension in the hunt for the creature cutting a bloody swathe through the Highlands, until S-Squad and Seton are able to use some handy magic to summon it while going across Loch Ness in Seton’s boat. I won’t spoil the general appearance or nature of the beastie, because for once it isn’t as obvious as what appears on the cover art; and there’s some intriguing background detail around sinister experiments, including references to a certain Aleister Crowley that really makes the cryptid even more interesting than Meikle’s usual excellent job in depicting cryptozoological matters. It’s a deeply impressive creature and an excellent job is done in putting across the sheer power and speed it possesses, making it one of the most dangerous opponents that Captain Banks and his men have ever faced in their duties. The introduction of the Colonel and Seton aren’t the only changes that Meikle makes to the S-Squad formula. Where many authors in a similar situation might have been happy to churn out a potboiler and retain the status quo, as I’ve discovered many times previously, Mr. Meikle is far too canny and skilled in his trade to follow that worn path. Their first encounter with the cryptid goes about as badly as possible, and after several adventures where they’ve escaped anything worse than cuts and bruises, the odds finally catch up with Banks and his men in a distinctly fatal way. Interestingly, the latter part of the novella makes it feel like this is a real change in the way that the series is progressing; the carnage that the creature inflicts is so wide-spread and in the public domain, as compared to S-Squad’s previous adventures which were all relatively small-scale and in remote, isolated areas where things could be hushed up and hidden away indefinitely. It might mean nothing, but I’m more intrigued than ever to see where Mr. Meikle takes the series in the future in terms of the overarching/background narrative. Operation: Loch Ness is yet another coup from the pen of William Meikle, and by far the best entry yet in the series. Some fantastic and pulse-pounding action scenes, atmosphere and tension so thick you could cut it with a knife, and another well-researched and vividly-imagined cryptid beastie all come together to form another classic in the ‘creature feature’ genre that Mr. Meikle has done so much to define and mould in the past few years. Plus there are welcome signs that he isn’t resting on his laurels, and is working hard to ensure that the S-Squad series evolves, so it doesn’t stagnate like so many of its counterparts in the genre.